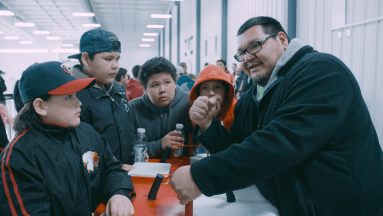 The most recent episode was filmed largely in Mistissini, documenting the dedication of Nathan W. Brien and Noland Gunner as they balance their work and family lives with the sport they love. 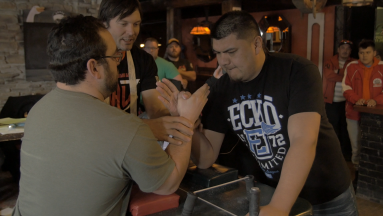 A new documentary series on the Aboriginal Peoples Television Network (APTN) aims to challenge common preconceptions of arm-wrestling as a pastime reserved for schoolyards or dank taverns. Arm Nation shines a light on the growing popularity of competitive arm-wrestling in Indigenous communities across Canada, focusing on the training and personal struggles of a dozen dedicated “pullers” in their quests to become national champions. The most recent episode was filmed largely in Mistissini, documenting the dedication of Nathan W. Brien and Noland Gunner as they balance their work and family lives with the sport they love. The show is both dynamic and intimate, providing a glimpse into their typical days at home and their many journeys to competitions thousands of kilometres south. Montreal-based Picture This Productions began working on the series three years ago, based on an idea from Trevor Sanipass, an arm-wrestling champion from the Eskasoni First Nation in Mi’kma’ki (Nova Scotia). Over time, the project evolved into a cross-country look at the little-known subculture and the particular way it enables Indigenous people to interact with the larger Canadian culture. “There’s sort of a web of like-minded people spread across this very vast country who have their niche interest in a certain subject, whether it’s a sport like arm-wrestling or something else,” David Finch, Arm Nation’s senior producer and director, told the Nation. The various ways that these people interpret and connect with their Indigenous roots is an important subtext weaving through each episode. Finch explains that some of the show’s characters are just discovering their roots while others are deeply involved in their communities, sometimes using arm-wrestling to help steer kids towards healthier lifestyles. For Noland in the Mistissini episode, the sport is a kind of salvation that gives him confidence and a sense of purpose while keeping him away from negative thoughts. He candidly shares his struggles with overcoming drug and alcohol dependencies while becoming a better father to his twins and a better son for his parents. “I’m trying my best to change because life is precious,” says Noland during the episode. Interspersed between the arm-wrestling are revealing shots of his training to become an electrician, a father-daughter gala and conversations with his dad Willy, who supports Noland’s path to sobriety by cheering him on at a competition in Ottawa. Nathan is the more experienced arm-wrestler of the two, having already participated in the World Armwrestling League (WAL) championships in Las Vegas. With quiet strength and incredible determination, he makes daily chores like chopping wood part of his workout routine and describes how arm-wrestling skills are useful in the bush. Finch has heard from various sources that people in northern communities have an almost genetic predisposition for “mutant-like strength” because of their traditional way of life. Watching Nathan at work in the bush and hearing the arm-wrestlers discuss their family history supports this theory. Arm-wrestling may have been part of Indigenous cultures for thousands of years. It is known to be one of the oldest sports in human history, with some suggesting that arm-wrestlers can be found in ancient Egyptian hieroglyphs from 2000 BC. According to the Ultimate Armwrestling League, the modern sport is actually based on a Native American game and was called “Indian wrestling” by 19th century settlers. Today there are 80 member countries in the World Armwrestling Federation, big-money professional competitions broadcast on sports channels, and a push to one day bring the sport to the Olympics. Finch says that he knew nothing about arm-wrestling before being pitched the idea but has learned much about its appeal while making the show. Finch, whose family is Swampy Cree from Northern Manitoba, says it was a real eye-opener to travel across the country, meeting so many different people and realizing unexpected connections. Growing up in Montreal, he didn’t directly experience the types of realities depicted in Mistissini, but has become familiar with various communities over 20 years of telling Indigenous stories with Picture This Productions. He got started in this field through music, being asked to write songs and then record sound for a friend’s student film. This eventually led to holding the boom microphone over actors in feature films, where he learned directing from watching and listening on sets. His first film was Longshots, a 1994 documentary about Indigenous kids living on Montreal streets, created with a friend named Maureen Marovitch, who later became his wife and working partner. The film got picked up by CBC, they formed a small production company, and have been making films ever since. The award-winning company travelled to numerous reserves and other communities across Canada while shooting the season’s 13 half-hour episodes, culminating with the national championships in Halifax. Finch says they have tons more stories to tell if they’re granted a second season and hopes to return to Mistissini to pick up where they left off. “We shot a lot on reserves across Canada (that had) never seen the spotlight before or (only) in very negative ways, when things go wrong,” Finch reflects.